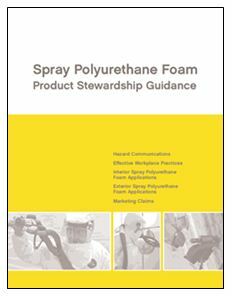 This page contains additional resources and product stewardship guidance for spray polyurethane foam contractors. Be sure to check the publication date of previously downloaded materials to ensure the most current version is being used. You may download the complete Spray Polyurethane Foam Product Stewardship Guidance Brochure, or sections below, which contain information on: hazard communications; effective workplace practices; interior SPF applications; exterior SPF applications; and marketing claims. Have You Read the SDS? Visit our poster resources page to download a full-size, hi-resolution version of select product stewardship guidance posters from the brochure. The following MDI videos are made available by International Isocyanates Institute in good faith, are believed to be accurate and reliable, but may well be incomplete and/or not applicable to all conditions or situations that may be encountered. No representation, guarantee or warranty is made as to the accuracy, reliability or completeness of the contents or that the application or use of any of the information and recommendations herein will avoid, reduce or ameliorate hazards, accidents, losses, damages or injury of any kind to persons or property. Viewers are therefore cautioned to satisfy themselves as to the applicability and suitability of said information and recommendations for the purposes intended prior to use.